He was just 22 and had joined the Indian Army only four months ago. Two days before New Year 1999 the family was at Amritsar station seeing him off as he boarded the train to join the 4 Jat regiment as a lieutenant. As the train pulled out, he stood by the door, stretching his hand out as if to touch her feet to say g oodbye. That was the last time when her mother saw him. 15 days later, he flew to Leh for his first posting in Kargil. Now he had gone to serve the country, wasn't coming back. 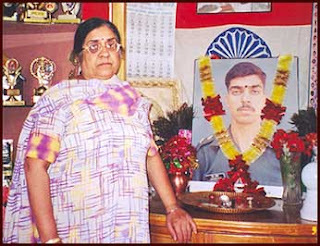 His name was Saurabh Kalia. It happened five years ago, on June 9, but his mother has not let his memory fall back behind her. 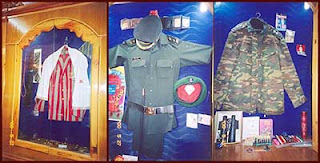 Lt Saurabh Kalia, who was later promoted to captain on the battlefield, was one of the first officers martyred by Pakistani intruders after Pakistan invaded the Kargil region of Jammu and Kashmir in 9th May 1999. On May 15, Lt. Kalia along with five other jawans -- Sepoys Arjun Ram, Bhanwar Lal Bagaria, Bhika Ram, Moola Ram and Naresh Singh -- had gone for a routine patrol of the Bajrang Post in the Kaksar sector when their patrol was captured by the enemy.Th ey were barbarically tortured for 22 days, after which their mutilated bodies were returned to the Indian Army. Sepoy Arjun Ram was only 18. Lt Kalia, only 22. Vaibhav, Lt. Kalia's brother, identified his body when it arrived in a coffin wrapped in the national flag in Palampur. Saurabh's face, he recalls, "was the size of my fingers, his eyebrows were the only visible feature, no eyes, no jaw, there were cigarette burns… it was very bad. My parents couldn't have seen him." I draw my strength from my son. Our suffering can never exceed the physical torture that he went through," Dr Kalia smiles. My salute the great brave indian SAPUT!!!!!!!!!! !